Hydrostatic pressure is the pressure that is generated by the weight of liquid above a measurement point, when the liquid is at rest. The height of a liquid column, of uniform density, is directly proportional to the hydrostatic pressure. The hydrostatic properties of a liquid are not constant and the main factors influencing it are the density of the liquid and the local gravity. Both of these quantities need to be known in order to determine the hydrostatic pressure of a particular liquid. Since hydrostatic pressure is the pressure solely generated by a column of liquid, it maybe the case that the pressure measured includes the additional component of atmospheric pressure acting on the liquid surface. In the cases of measuring absolute pressure it is necessary to also measure and subtract the atmospheric pressure to determine the true hydrostatic pressure. The local gravity depends on latitudinal position and height above sea level. For convenience the most popular pressure units for measuring hydrostatic pressure are metres of water and feet of water at 4 deg C (39.2 degF) with a standard gravity of 9.80665 m/s2. The density of pure water at 4 deg C is very close to 1000 kg/m3 and therefore this has been adopted as the standard density of water. Another reason for the significance of choosing 4 deg C is that it is very close to the temperature that water reaches its maximum density. The density of a liquid will vary with changes in temperature so this is often quoted alongside hydrostatic pressure units e.g. mH2O @ 4 deg C.
In practical terms hydrostatic pressure units are rarely absolutely precise because the temperature of any liquid is not always going to be 4 deg C.
You will also come across another temperature standard of 60 deg F (15.56 deg C). This can lead to confusion and inaccuracies when the temperature is not labelled alongside the hydrostatic pressure unit. For most applications the different temperature dependent unit conversions are not significant enough to influence the results, since the reading accuracy is often much wider than the difference in the pressure unit conversion factor at these 2 temperatures. In summary hydrostatic pressure units are a very convenient method for relating pressure to a height of fluid but they are not absolute pressure units and it is not always clear what density/temperature has been assumed in their derivation, so be very cautious when using them for high precision level measurements. In fact some institutions are discouraging their use because of the very reasons mentioned above and recommending the use of fixed value pressure units instead of units that are open to interpretation and are dependent on gravity or temperature. Online tools for converting hydrostatic converting and calculating hydrostatic pressure. 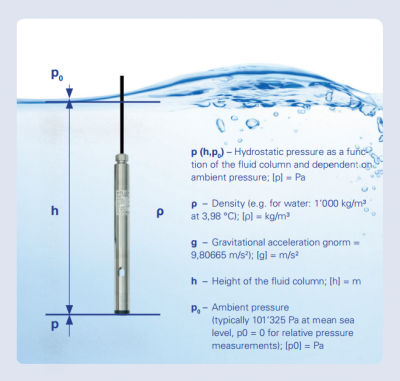 Articles with more information on using and selecting hydrostatic pressure measurement instrumentation. We are measuring water level in an open tank using a vented pressure gauge. When the liquid is discharged into the tank, bubbles are entrained. The bubbles then float to the surface and dissipate. The additional volume of bubbles increases the level of the water in the tank but not the volume of water in the tank. Can we expect a pressure sensor mounted in the bottom of the tank to read the same value whether there are bubbles or not? Or put another way will the vented sensor read the pressure generated by the water alone whether the compensated atmosphere is entirely above the water or partially entrained in the water? If you consider the formula for calculating hydrostatic pressure, the main variables in your application are density and height. Since the density will drop by the same proportion as the increase in water surface height, they will both cancel each other out. Therefore the measured pressure will remain the same irrespective of the change in visual liquid level due to bubble entrainment. How many bars pressure does a gravity fed water system generate? Our house has the water header tank located in the loft. The bathroom is one floor below the cold and hot water tanks. The pressure generated by a vented water tank is equal to the difference in water height between the water surface inside the tank (typically near the top when there is no demand) and the measurement point. Since the pressure generated is dependent upon the height of water above the measurement point, the pressure will change at different levels within the house. 1 metre of water is approximately equal to 0.098 bar, so the difference in height (m) between the vented/open header water tank and the water tap (faucet) multiplied by 0.098 will equal the pressure in bar. 1 foot of water is approximately equal to 0.03 bar, so the difference in height (ft) between the vented/open header water tank and the water tap (faucet) multiplied by 0.03 will equal the pressure in bar. Why is temperature included with height of fluid pressure units? Pressure units which are related to the height of a liquid often include a reference temperature e.g. 50 mH2O @ 4degC. The hydrostatic pressure of a fluid at a certain height is determined by the total height of fluid above that point. If the temperature of the liquid is increased it will expand in volume, thus increasing the fluid level. However the hydrostatic pressure will remain the same, therefore when quoting a pressure in terms of fluid level it is useful to know the temperature. For example a tank full of water located above ground level on a warm day in the UK might be 28 degC during the middle of the day, whereas during the early hours of the morning it might drop as low as 8 degC. The difference in level due to a 20degC change would be approximately 0.2% without any change in pressure. This does not seem much but when you consider that many pressure sensors can measure to a better precision than 0.25% of full scale a 0.2% change in water density is quite significant. For applications where you are interested in the weight of the tank contents rather than the volume, a fluid level reading which is independent of changes in density due to temperature variation can actually be very useful. A hydrostatic pressure unit can be specified for any reference temperature, but to simplify calibration and establish commonality across manufacturers, standardised temperatures are used such as 4 degC (39.2 degF) and 60 degF (15.56 degC). 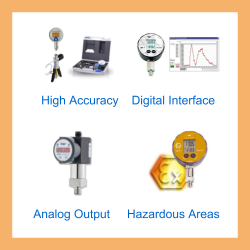 Many manufacturers do not explain on their product data sheets which temperature they have used, particular with sensors where absolute accuracy is not so important, so if high accuracy is important to your application, calibration should be verified during installation. How well do liquid height derived pressure units such as mH2O & ftH2O relate to the actual liquid height measured in metres & feet? Since liquid height derived pressure units have a fixed value, they rarely match the real height measurement of a liquid. This is because the hydrostatic pressure generated by a measured height of liquid will vary depending on the liquid temperature and local gravity. 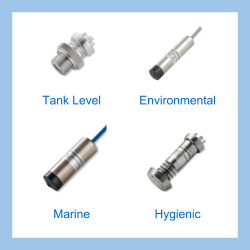 Send us your enquiry for a product associated with this Hydrostatic Pressure page, and get assistance with selecting a product for your application.